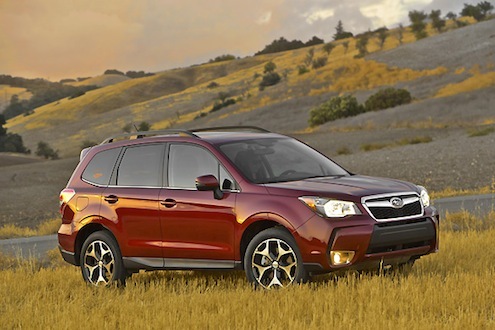 The all-new 2014 Subaru Forester has earned the IIHS Top Safety Pick and Subaru remains the only manufacturer with IIHS Top Safety Picks for all models. Late last year the 2014 Subaru Forester had just been launched and it earned the Top Five-Star Rating in the Euro NCAP Safety Test. This is the highest possible rating a car can get in the 2012 European New Car Assessment Program (Euro NCAP) safety performance test. Now Subaru has announced the new Forester has earned the Insurance Institute for Highway Safety's (IIHS) Top Safety Pick. This puts Subaru in rarified air as it is the only manufacturer with IIHS Top Safety Picks for all models for the fourth consecutive year (2010-2013). The important safety award is given to vehicles for good performance in its moderate overlap frontal, side, rollover and rear impact evaluations. The Subaru brand has some of the safest vehicles on the planet and has been rated high in the area of safety for many years. Safety doesn’t just happen, and was designed into the 2014 Forester while it was still on the drawing board. It started with Subaru’s goals and targets for the new crossover before it was ever designed. Subaru has been testing their cars since the 1960’s before safety testing methods had yet to be established. The safety targets are set first, and then the design team uses computers to conduct impact simulations. Those results were then incorporated into the new Forester design. Real-world impact simulations are then conducted in Subaru’s own test facility. Hundreds of new Forester test mules were smashed before the crossover ever reached production. Subaru goes far beyond what is expected from the various national safety tests around the world including the Euro NCAP Safety Test. This rigorous testing is done on every Subaru vehicle and has helped the Japanese automaker become the only automaker to earn a 2013 Top Safety Pick for every model it builds. "Safety is always top of mind as we aim to inspire confidence and peace of mind on every road in all conditions," said Shiro Ohta, president and CEO of Subaru Canada, Inc. He went on to say, "Subaru's ring-shaped reinforcement frame has been proven in more than a decade of use. This design provides excellent protection with the structure increasing cabin rigidity and absorbing impact energy from any direction." The Japanese automaker uses a unique "ring-shaped reinforcement frame body" by optimizing the impact energy relay structure. They use high tensile steel that allows reduction in weight for fuel-efficiency, but it provides higher collision safety performance to impacts from all directions and enhanced passenger safety. The all-new global 2014 Subaru Forester is getting praise from around the globe for its all-wheel-drive capability, excellent fuel mileage and off-road X-Mode for sports enthusiasts. Now the new crossover is one of the safest mid-size SUVs on the planet.